Under U.S. law, adult patients have the right to make their own decisions about their health care. Even if you become too ill to communicate, you can still get the type of medical treatment you want by completing an advance health care directive to prepare for that possibility. There are two types of these directives in Nebraska: a living will and a power of attorney for health care. 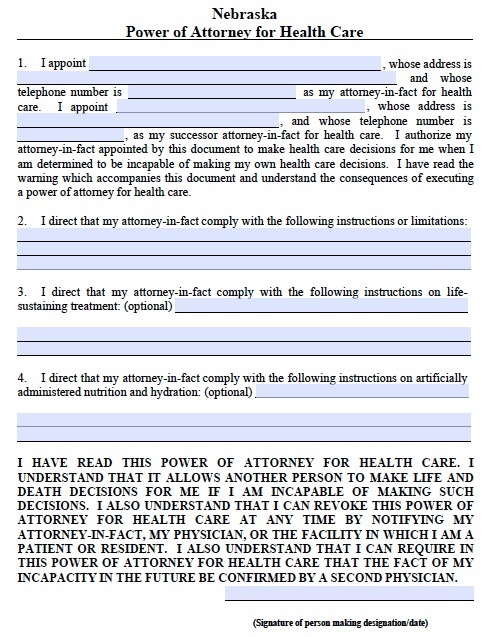 The power of attorney for health care lets you name another person as a representative to make health care decisions for you if you become too sick to make them. The representative should be a spouse, or a close relative or friend. Nebraska does not allow you to choose the following to act as your agent: your doctor, someone already serving as a health care representative for 10 or more people, or an employee of your doctor or healthcare provider, unless he or she is a relative. The living will allows you to specify what treatment you want if you have become unable to communicate and terminally ill. Thus, if you experience serious brain damage, and will never regain consciousness, the directive will state whether you would prefer to discontinue any life-sustaining treatments. Consider how much you value independence and quality of life when completing a living will.